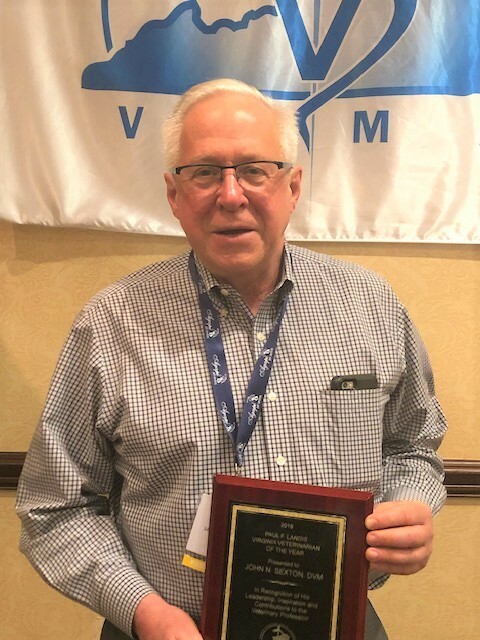 RICHMOND- The Virginia Veterinary Medical Association (VVMA) has announced Jack Sexton, DVM, as this year’s recipient of the Paul F. Landis Veterinarian of the Year Award. Presented in honor of former VVMA and American Veterinary Medical Association President Dr. Paul F. Landis, this award is given to an individual who has made significant contributions to veterinary medicine and the creation of a strong local and state veterinary association. Dr. Sexton has been practicing veterinary medicine for over 40 years, earning a staunchly loyal client base thanks to his dedication to saving beloved pets and his responsive, positive manner. A native of Northern Virginia, Dr. Sexton has served as the director of McLean Animal Hospital since 1993, but started his career there in 1979 as an associate. He holds both a bachelor’s and a master’s degree from the University of Maryland and graduated from the University of Georgia’s College of Veterinary Medicine in 1978. Dr. Sexton’s interest in his profession is highlighted by his willingness and commitment to serve. He has served as past president of both the Northern Virginia Veterinary Medical Association and the Virginia Veterinary Medicine Association. Dr. Sexton has also given his time to his community by serving on the Fairfax County Animal Shelter Advisory Committee, serving as an advisor for the Fairfax County Humane Society as well as the Virginia-Maryland College of Veterinary Medicine’s Teaching Hospital Advisory Committee. He has also volunteered his expertise and life experience to VMCVM’s mentorship program. Dr. Sexton has more than earned the Paul F. Landis Veterinarian of the Year award. The Virginia Veterinary Medical Association (VVMA) is a professional organization of veterinarians dedicated to preserving and enhancing the quality of human and animal life through veterinary medicine. The organization aims to establish and enhance open communication between members of the association and industry representatives. The VVMA provides continuing education programs and conferences, supports its members through mentoring programs, and serves as an advocate and voice for the Virginia veterinary medicine community. For more information, visit http://www.vvma.org, or call (804) 346-2611.